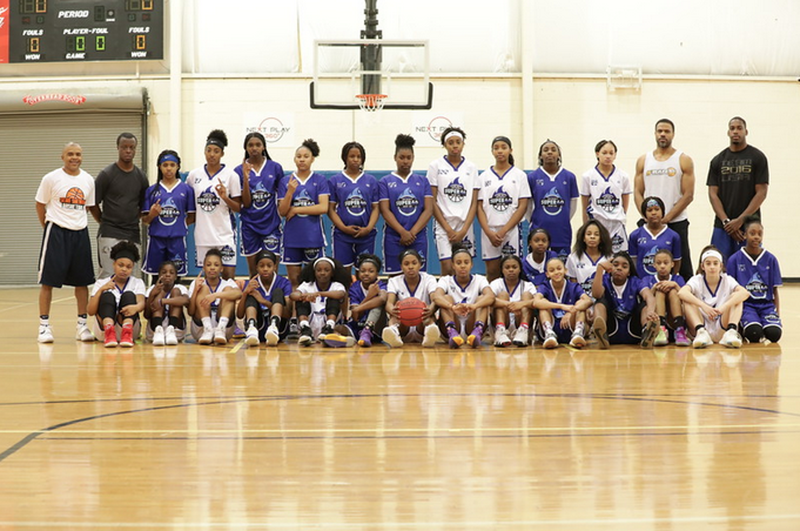 Super 60 Atlanta kicked off for the 1st time this year. A different breed of players in this area as their skill level and mindset is far advanced compared to other regions. Still a hot bed full of talent, the future is still bright for these ladies who will soon be the talk of Georgia and Tennessee. Special thanks to the coaches and staff, TV Media, Queen of Highlights, Dorian Lee BBall 101, Sean Sherman, and Expo Basketball Performance. Makayla Raines, 5-4, point guard, 2023- Such a talent to watch. She can really pass the ball and see the floor, she knew where her open teammate was on the court. Her entry passes were perfect, she can create for herself and others. Shoots it well from outside, gets to the basket, and handles the ball very well. Has so much potential, a must watch player! Just continue to work on having a consistent mid-range and outside shot. Cleo Johnson, 5-0, point guard, 2024- Crafty player that competes, gets to the basket, has very good handles, shoots it well from outside, plays both ends of the floor. Brings energy, gets on the floor for loose balls, active hands on defense. She’s all business in attack mode when she’s on the floor. Has a lot of potential and will only continue to get better from here. Anna Vereen, 5-11, forward, 2023- Has good size and length, very athletic. Run’s the floor well, has good hands, can put the ball on the floor and get to the basket. Good defender, able to block shots, and is active on the boards. Needs to continue to work on mid-range/outside shot. Has a lot of potential with Division 1 qualities. Imari Berry, 5-7, point guard, 2024- Whenever she is on the floor she stands out. Very special player in the making, plays both ends of the court equally well. Does the little things, gets back on defense, makes the extra pass, grabs rebounds, pushes the ball up the floor, and finishes at the rim with contact. Not much she can’t do except learn to be a vocal leader and continue to have a consistent mid-range/outside shot. Must watch player! Johanna Potter, 6-0, post, 2025- Tremendous upside and advanced for her age. Very good size and length, solid footwork down low, active on the boards, able to block shots with ease. Run’s the floor well and has good hands, able to finish around the rim with contact. Has so much potential and is a must watch player! Amiya Porter, 5-4, guard, 2024- Has a fundamental skill set, high I.Q player, shoots the ball well from outside, knows what to do with the ball, see’s the floor, makes good passes to the open teammate. Brings energy when she’s on the court, picks up on defense, handles the ball very well. A skilled player that’s above average. Has so much potential, the future is promising. Makaylin Johnson, 5-0, point guard, 2025- Athletic and quick, pushes the tempo and gets the ball up the floor. Good court vision, makes good passes to the open teammate, handles the ball very well. Penetrates the lane and gets to the basket. Very efficient guard that knows what to do with the ball. Advanced player with a lot of potential. Erica Moon, 5-5, point guard 2023- Aggressive player that stays in attack mode, a true competitor. Has a flashy game, plays north and south and gets right to the basket. Handles the ball very well, hard to contain, active on defense as well, will get steals, rebounds, and hustles. A definite problem with Division 1 qualities, a must watch player! Tatum Brown, 5-3, guard, 2025- Highly skilled player, gets it done on both ends of the court. Active hands on defense, plays the passing lanes, handles the ball very well and can get to the basket. Shoots it well from outside, has good court vision who’s passes are spot on where they need to be. Above average player with a very good skill set. Must watch player this Summer! Hannah Stanley, 5-4, point guard, 2024- Has good point guard skills, handles the ball well, makes good passes on the fast break, attacks the basket and goes up strong. Needs to continue to work on mid-range/outside shot. Plays hard and hustles on both ends of the court. Jamiah Gregory, 5-7, forward, 2023- Athletic with hang time, aggressive and physical player that’s active on the rebounds, runs the floor, good hands, can put the ball on the floor and get to the basket. Needs to continue to work on mid-range game but has potential and Division 1 qualities. Taliah Cornish, 5-4, point guard, 2024- A high IQ player, an assist first point guard that can get her teammates the ball. Handles the ball very well, can penetrate the lanes and get to the basket. Makes good decisions with the ball, has good court vision. Has a nice mid-range/outside shot. Above average player with a lot of potential. Monet Dance, 5-3, point guard, 2023- She’s a real problem, crafty player that gets wherever she wants on the court. Can create for herself and others, she won’t be stopped. Made some very nice passes, good court vision, shoots it well, and attacks the basket. A Division 1 player for sure. Chazadi Wright, 4-10, point guard, 2024- A true point guard that can deliver a pass, can run the pick and roll with ease. So poised and patient, highly skilled and above average player. Has nice handles, can get to the basket and finish at the rim, picks up on defense and applies pressure. She knows what to do with the ball and can create for herself and others. A must watch player with a lot of potential. Mia James, 5-0, point guard, 2025- Makes plays, can shoot from outside and get to the basket. Nice ball handling to get by the defenders, makes good passes, gets the ball to the open teammate, very skilled, and advanced for her age. Makes good decisions with the ball, plays both ends of the floor equally well. She can score the ball and is a must watch player this Summer. Nicole Frauster, 5-6, guard, 2023- Shoots the ball well from outside, plays hard and hustles. Has good handles, knows how to move without the ball to get open. Made some good passes on the fast break and will attack the basket when its open. Crystal Henderson, 5-3, point guard, 2023- Quick an athletic guard that pushes the tempo. Plays north and south and will make her move and get to the basket. Has good court vision and makes good passes, crafty and can handle the ball. Has a nice shot from outside, and is aggressive on defense as well, picks up and applies the pressure. A must watch player with Division 1 qualities. Camryn Register, 5-5- guard, 2025- Has sticky fingers and can defend the ball and get steals. Quick and athletic, picks up full court and applies the pressure. Has active hands and plays the passing lanes. Will attack the basket when the opportunity is open. Still young and needs to continue to sharpen her offensive game, but played well. Nickyia Daniel, 5-9, forward, 2024- Has good size and athleticism. Active on the boards, can put the ball on the floor and get to the basket. Run’s the floor well, good body control, coordinated with good hands, able to finish around the rim. Needs to continue to work on mid-range game. Has a lot of potential. Jania Akins, 5-7, guard, 2024- Skilled player that can score. Aggressive on both ends of the floor, moves without the ball to get open, doesn’t force much if the opportunity is not there. Good court awareness, knows when to get to the basket, and make the extra pass to the open teammate. Handles the ball well has a nice overall skill set. Applies the pressure on defense and hustles after loose balls. Has a lot of potential for her age, keep an eye out for this one. Crystal Collins, 5-5, guard, 2023- Physical guard that plays hard on both ends of the court. Handles the ball well and can get by defenders to get to the basket. Made good passes on the fast break, picks up full court on defense, has active hands, plays the passing lanes. Hustle player that does the little things. Needs to continue to work on mid-range/outside shot, but played very well. Jada Green, 5-7, post, 2023- Has good size and hands, runs the floor well, active on the boards. Can put the ball on the floor and get it up the court. Needs to continue to sharpen the footwork and mid-range jumper. Played hard. Chyenne Johnson, 5-0, point guard, 2025- Has good handles, attacks the basket when the opportunity was open, plays hard, positive attitude, continued to compete and didn’t let a bad play affect her. Played hard and hustled when she was on the court. Rayelle Lundy, 5-1, point guard, 2023- Aggressive and physical player that can get to the basket and finish with contact. Plays north and south and is able to get by her defenders by using one move and getting to the rim. Active on defense, will pick up full court, plays hard and hustles. Will also get you rebounds. A competitor and will go at you.